Simple caftan pattern quick and easy how to sew your own caftan. Make your own caftan within 2 hours! 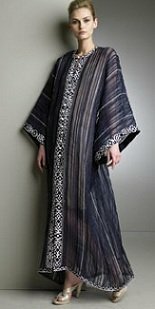 I am not an expert in sewing but know how to sew simple and easy pattern clothe like caftan pattern to make it my own. I found that the guides from Modestclothes website are very handy to make your own kaftan for novice like me. 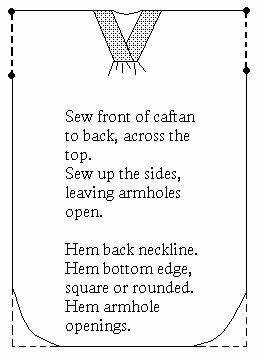 The instructions are easy to follow with added diagrams for better understanding of the required cuts and sew. I have simplified and made easy to follow the instructions as below. The principal guides and diagrams are courtesy of Modestclothes. Measure from the nape of your neck down to your desired length. Buy fabric of 45” wide by twice of this length. 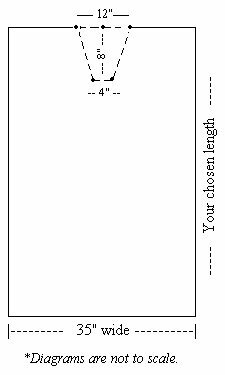 Cut the width of both pieces to 35" (see above diagram). From the excess material, cut two rectangles, each measuring 6" wide x 12" long from the excess material. Fold each in half, lengthwise, wrong sides together; iron to crease the folded edge. Place a pin in the center top edge of the fabric. Measure down 8" and mark with a pin. Along the top edge, place pins 6" to either side of the center pin (total of 12" width). Place pins 2" to either side of the bottom pin total of 4" width). Mark with pencil by joining all the points together. See Diagram 1 above. Cut out the neck opening following the pencil marking. Take the two folded rectangles and pin them to the neck opening, aligning raw edges. Note that there will be some excess at the top and bottom. Stitch with a 1/4" seam allowance. Turn the rectangles toward the center and overlap the bottom edges. 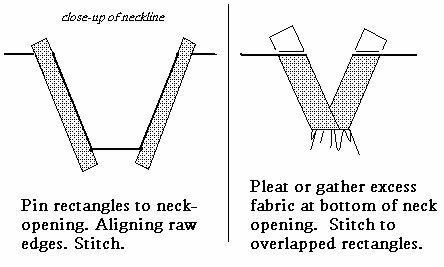 Gather or pleat the excess fabric along the bottom of the neck opening and pin it to the overlapped edge of the neckline and stitch. Trim away excess fabric from the rectangles along the top and bottom of the neckline. 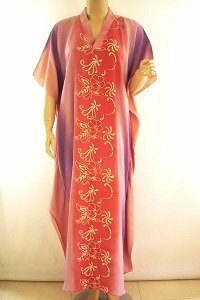 Place the front of the caftan together with the back, right sides together. Stitch along the top. Stitch the sides, leaving a 10" opening on either side for the arms. You may choose to cut a curve bottom or leave it straight. Hem the back neck opening. Congratulations! You have made your own lovely kaftan. If you follow the instructions above, your kaftan will look like the kaftan as in the picture below. Want to make kaftan ala Oscar de la Renta as below. Please click here for easy steps how to make this pattern-less kaftan. 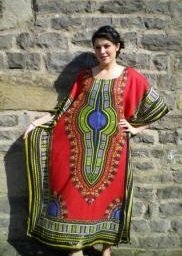 Here caftan pattern quick and easy steps on how to make comfortable lounge wear kaftan.